Truckeroo is now open! (Friday, June 30) Join us at DC Fairgrounds until 11pm. Your happy hour and dinner service is now being served by the finest of DCs food trucks! 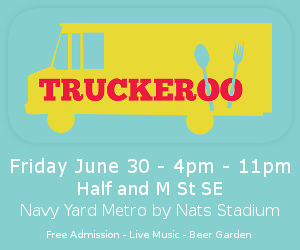 Truckeroo is located across from the Navy Yard/Ballpark metro entrance (Half St SE and M St SE). The event features music, games, adult beverages, plenty of seating, and of course, great eats! Here is the list of trucks attending the June 30 Truckeroo.